Hair tucked, no makeup: Sarah Thomas tries to blend in. 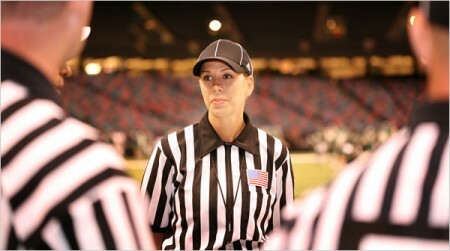 That’s pretty much the worst Sarah Thomas has heard – some guy up in the stands. What game was it? She can’t remember. Maybe last year’s game between Memphis and Marshall. 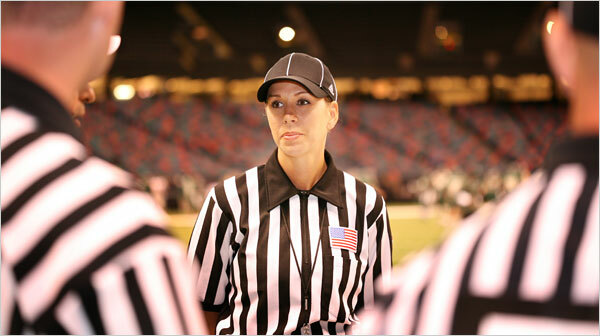 Maybe the one at Liberty Bowl Memorial Stadium between Memphis and Jacksonville State, September 15, 2007, the night she made history – but not, she insists, a statement – as the first woman to ever officiate an NCAA Div. 1 football game. Was it an insult? A compliment? Did he know she was a girl? Thomas says it’s hard to tell. The 5”11, 36-year-old mother of two who helped lead the University of Mobile’s Lady Rams basketball team to the 1993 NAIA national tournament is able to fill out the stripes in ways that Penn Wagers simply cannot. Which is of course why the Conference USA, Mountain West and Western Athletic Conference line judge says she’d be lying if she said being a woman didn’t make her side job (she’s a pharmaceutical rep during the week), in certain respects, more challenging. There are stares. There are extra interviews. ESPN can’t resist her. But the opposite – that it makes it a bit easier – is also true. A coach from one school – Thomas declined to say which, other than that it was Baptist – had a reputation for being particularly nasty to officials. She was warned to expect the worst. Around Thomas, they needn’t be. As has her faith, says Thomas, whose entire officiating crew prays before each game. Gender, she says, simply doesn’t enter into it. What about girls actually playing football? It was unlikely that the woman who might be there to call that girl out of bounds would say anything less. I’ll commit illegal use of hands, but never false start on this RILF. Okay sorry. I had to do it.